If you are installing or replacing a low-slope commercial roof, you no doubt have realized there are a wide range of products available to you. Among the fastest growing segments of the market are heat welded membranes for thermoplastic roofing systems. Heat welded membranes were designed to improve durability of these systems because they are able to withstand even the most extreme environmental exposure. Regardless of configuration, function, slope, height, or location, heat welded membranes are an excellent roofing choice. Heat welding is a common process for thermoplastic roofing membranes. The process is used to join the membranes by heating two pieces simultaneously and pressing them together. As the pieces cool, they form a permanent bond. The main benefit of heat welded membranes is that when the pieces are joined correctly, they essentially form one piece – in other words, the seam becomes invisible. This is especially appropriate for roofing as it improves waterproofing but also makes for a much more durable roof. 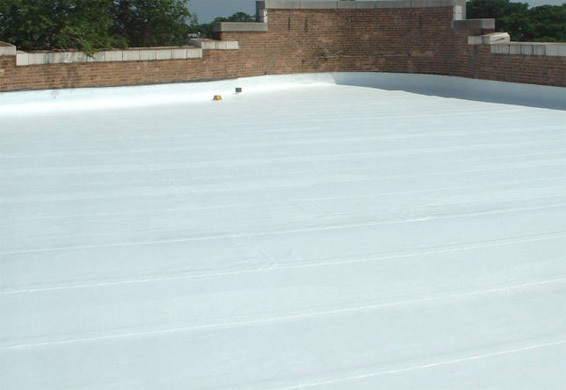 Thermoplastic roofing membranes for low-slope roofs have been popular around the world for more than 50 years. Today, with advances in roofing technology, the durability, resilience, and versatility has improved, and heat welded membranes are an example of improved roofing technology. One specific example of heat welded membranes is an SBS system. These are essentially modified bitumen roofing systems that feature a synthetic rubber-based technology for improved flexibility regardless of temperature ranges. More specifically, SBS heat welded membranes are a common product that feature a durable, non-woven composite polyester mat that is usually strengthened with glass fiber. Still, not only is there a wide range of products suitable to different construction projects, there are also a wide variety of heat welded membranes. The type of roofing product most suited for your roof will depend on a variety of factors, not the least of which is your budget. Indeed, even if we are only discussing SBS heat welded membranes, you’ll find a variety of available systems. In short, it is important to work with a qualified roofing professional when considering the best products for your commercial construction. Remember, your commercial building is an important investment and so is its roof. Not only is the roof important structurally, but it also protects your building and all of its contents. Commercial roofing is not something to be taken lightly. When talking to your roofing professional be sure to ask about heat welded membranes and how they may improve the quality and durability of your roof. Thermoplastic roofing systems are common and almost always feature heat welded membranes, but only your roofer will know which type of membrane is best for the project.